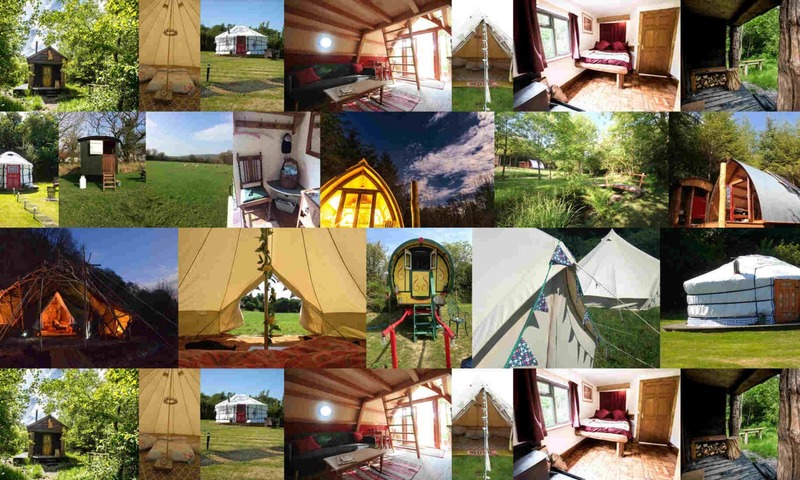 Why not escape to a magical place in the heart of beautiful West Devon… a place you can completely relax and experience the simplicity of living under canvas, next to nature. 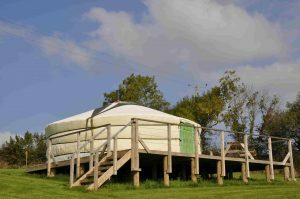 Three authentic Mongolian yurts, provide a fitting child-friendly retreat for those of you looking for a real haven from the hustle and bustle of modern life. There is also a camping field for those “bring your own tent” happy campers. Oak Tree Lane is a small holding on a family run farm, set within 40 acres of pasture land and woodlands positioned in the heart of West Devon with stunning views overlooking Dartmoor National Park. It’s also located a mile from Roadford Lake Country Park and its Watersports Centre. At the lake you can enjoy a range of activities both on and off the water. 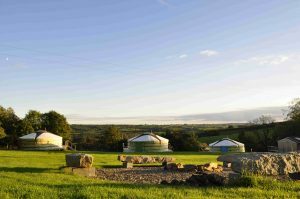 Set within a tranquil valley in Devon, each yurt stands tall on a wooden deck, nestled into the hillside in its own private spot, with loads of space to explore, adventure or unwind. A yurt is traditional Mongolian tent consisting of wooden walls, an insulating felt layer and a heavy waterproof canvas over the top. 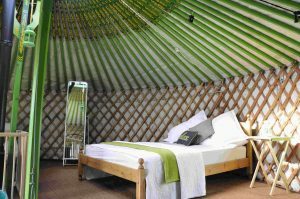 The yurts have been handmade to order by the finest Mongolian yurt builders and each one has been tested in the freezing Mongolian winter to ensure a warm and cozy holiday in the UK. Sleeping a family up to 6 people the thoughtfully equipped yurts have a comfy double bed, a double day bed and 2 single futons. Coir matting and rugs have been provided to keep your tootsies warm, along with a central log burner making sure that you are cozy come what may. Outside on your private decking area with a picnic bench and BBQ facility, soak in that view and perhaps eat al fresco, perfect for hazy, warm evenings with only the stars and surrounding natural habitat to share the evenings with you. Due to encouraging an eco-friendly approach, OakTree-Lane Yurts do not have any electricity; they are fitted with solar powered fairy lights and lanterns, which only adds to their charm. 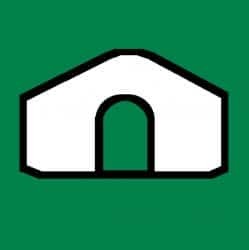 Oak Tree-Lane offers each Yurt your own fully equipped Field Kitchen accommodating forks, knives, spoons, plates, bowls, glasses and children’s plastic glasses, table and chairs, gas cooker, fridge-freezer. You also have the provision of your own private sanitary facilities comprising of a shower, wc and sink. Oak Tree Lane is located just off the A30 between Launceston and Okehampton on the Devon/Cornwall border. Surrounded by the lush green Devonshire countryside, it is conveniently situated under a mile from Roadford Lake Country Park. With over 730 acres of water, Roadford Lake has something genuine to offer all those that visit and is the largest lake for watersports in the South West. At the lake you can enjoy a range of activities both on and off the water including sailing, windsurfing, kayaking, high ropes, climbing and archery. Or simply just relax with a delicious cream tea and enjoy the view. As Oak Tree Lane is right in the heart of Devon, you can reach both the north and south coasts and their very different coastlines in under an hour! You can be in Cornwall in twenty and numerous National Trust properties all around. The Eden project is only a pleasant hour’s journey away across Bodmin moor… all in all there really is a great deal to do so don’t be surprised if you want to return time and time again!